Of course, before you even begin to think about the social side of things in Newcastle, you’ll need to consider where you are going to live. Fortunately, the city is filled with appealing areas. For affordable living, most properties in Heaton are available to rent at around £50 to £60 per person per week. The district is home to a wide variety of takeaways and grocery stores, and there’s a couple of bustling bars too. It’s also just a 20-minute walk from the city centre. Gosforth boasts similar rental rates to Heaton. If you opt for this district, you can enjoy a great selection of local shopping facilities, as well as regular buses and Metro services to the city centre. If you don’t mind paying a little more money for rent, Jesmond is highly recommended. Rent is often between £65 and £85 per person per week but you will be right next to Osbourne Road — a strip filled with stylish bars, fantastic restaurants and a very friendly atmosphere. Walton Robinson has a selection of properties available to rent in all of these districts, with some available with low admin fees and guaranteed 12-month contracts. Head to Mosley Street and you will come across Bijoux — a pre-bar that is often the venue of choice for Geordie Shore cast members. Neighbouring bars like Perdu, Floritas and TupTup are also top picks for a night out in Newcastle. When it comes to finding a nightclub to close the night, check out Digital. The venue often welcomes world-famous DJs to showcase their skills on the decks — Ms. Dynamite, Blasé Boys Club and Duke Dumont are all visiting the club in the weeks to come. Make sure to keep an eye on their events page for details of upcoming acts. For times when you’d like to dine out, Newcastle is host to many attractive restaurants that are perfect when you are on a budget. 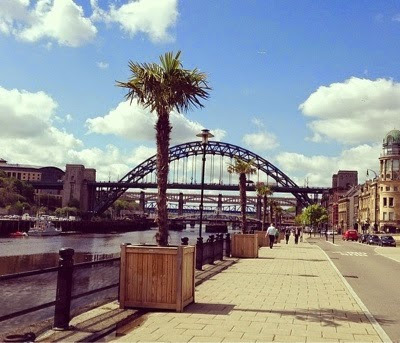 Start the day in style by sampling the delicious breakfasts at Quay Ingredient — it’s based right near the River Tyne too, so a relaxing stroll is a must too. For unique snacks head along to The Bridge Tavern and try some pig’s head croquettes or haggis toasties, while Ernest is a brilliant blend of a bar, restaurant and café. Every dish is home cooked and is recommended when you are looking for somewhere for dinner. It is a great city for being a student. I came to university here and never left! Ah I didn't know that Alison - it certainly is a wonderful place.